Weerachai Khonlar looks for customers on Thursday, one day after dodging bullets amid street battles in Bangkok. This is his damaged motorbike. Bangkok, Thailand (CNN) -- Weerachai Khonlar was ferrying passengers to a Buddhist temple in the protest zone in Bangkok when shots rang out. One bullet pierced the fiberglass on the front wheel of his royal blue Honda R125, the other barreled straight through his seat and into the storage compartment. Khonlar's passenger jumped off, as did the wiry 37-year-old taxi driver. "It's a miracle I survived," he said. 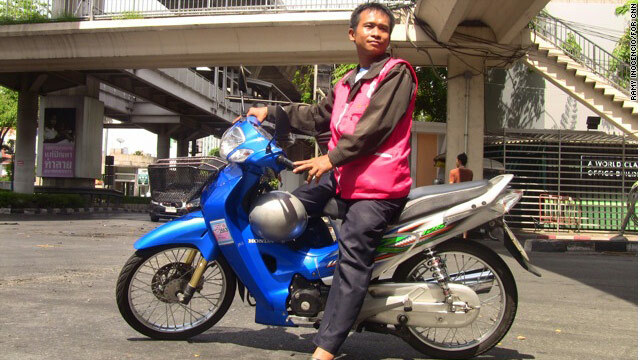 "If I hadn't jumped off my motorbike, I'd have been shot twice." "My right leg and lower back would have definitely been hit," said Khonlar, who does not know who was shooting -- only that the bullets came from behind. Khonlar got caught in the crossfire as he neared Wat Patumwanaram Temple, a Buddhist temple that had been a haven for thousands of anti-government protesters early in the week. But Thursday there were a few people there -- and six bodies could be seen. The Thai government moved to evict the protesters on Tuesday, after they had set up camps in a key downtown district during the past few weeks. The move triggered riots, fires and intense street battles. At least 44 people have been killed in clashes in the past several weeks, and nearly 400 people were injured, government officials said. 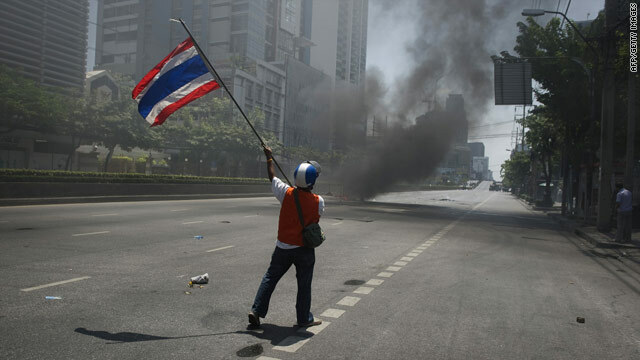 The crisis follows a months-long standoff between Thai authorities and protesters opposed to the government of Prime Minister Abhisit Vejjajiva. The protesters -- known as the United Front for Democracy Against Dictatorship (UDD) -- support Thaksin Shinawatra, who was prime minister from 2001 to 2006, before he was ousted in a bloodless coup. On Thursday, Khonlar was waiting for would-be customers walking out to the intersection. He said his wife and two young sons were "shocked" to learn about his near-death experience, but he said he wasn't nervous anymore. "I've gotten used to it. I don't feel scared today. Besides, I didn't die yesterday."